Content enterprises today often tend to have a myopic view while considering cost of application – evaluating the cost of licensing fee alone and overlooking multiple parameters that are at play, while deciding on the right technology to solve for their challenges. They tend to focus on the cost of acquiring media asset management (MAM) systems and ignore the associated costs that are incurred in getting their content to the customer. This contributes to lower margins. The M&E industry is not really thinking about high TCO (Total Cost of Ownership) within traditional MAM investments – especially costs beyond upfront capex investment – maintaining and managing these standalone applications, upgrade costs, system & software support costs, hosting, help desk, subject matter experts to manage and administer etc. And if they operate content in more than one site, chances are that there is duplication in MAM investments across these sites. 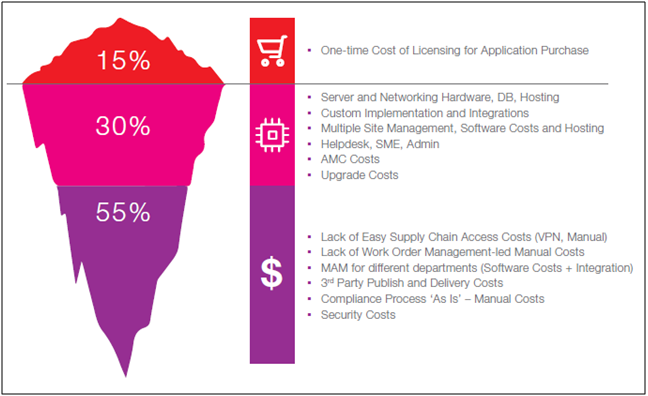 With all of these, TCO reduction is increasingly only a remote possibility. However, what needs to be debated dispassionately is the impact traditional MAM systems have on Total Cost of Operations (TCOP), speed and quality of delivery. A traditional MAM is not expected to extend beyond the facility. Why? Traditional MAM systems are difficult and time consuming to modify to cater to emerging media management needs. MAM automation is today limited to media management within the facilities. Getting a traditional on premise MAM to additionally manage a growth in processing, packaging and delivery of content for VOD/OTT platforms is challenging and enterprises are creating their own software to manage this. This results in additional cost and problems around agility for the business. VPN clients have a genuine need to access applications outside their facility. However, in its absence, manual interventions to send and receive content from suppliers as well as monitor and track status via spreadsheets become unavoidable. Interactions and collaboration on the MAM system amongst supply chain participants – production house, post production vendor, studio and the network are limited. This is becoming a key problem with the increase in volume of content being created and businesses demanding shorter TAT. Additionally, daily tasks like accessing high res footage for Trailer/Promo creation remains a manual process involving many stakeholders and follow-ups culminating in manual execution. Automation remains in pockets, and work order administration between multiple tasks in a business process is still manual. This is potentially a big problem and all these, leave no room to enhance speed or cut costs. Innovations in technology offer new possibilities in automating tasks that are hitherto manual. For instance, automation of promo versions rendering or re-timing of subtitles when versioning edits of masters are created, are possible today. Which is the reason why we are saying, while reinforcing TCO is important, TCOP is even more relevant. Businesses should expect more from their MAM investments – more digitization, more speed, better quality, much lower TCO and TCOP. A deep dive into this divulges that on an average, the MAM application itself makes up only about 15% of your total costs. The remaining 30% of the costs, come from maintaining and managing the MAM application. What is deeply hidden is that, about 55% is the additional cost of running the operations and service delivery because of the inadequacies of the traditional MAM application. Reducing TCOP is therefore critical for enterprises, especially those who use multiple on premise, non-scalable, MAM systems across different divisions, departments and locations. At Prime Focus Technologies (PFT), we believe that cost savings of 30-40% or more can be achieved by managing the operations efficiently across the supply chain. This has a lasting effect on the TCOP. Every solution we create, every product we conceive, is designed to reduce costs, in sync with the concept of TCOP in M&E operations. Experience the power of ONE with CLEARTM Media ERP Suite. Visit Prime Focus Technologies at booth # SL9605 at NAB 2017 to know how you can lower your TCOP. Get more from technology. Be MORE.